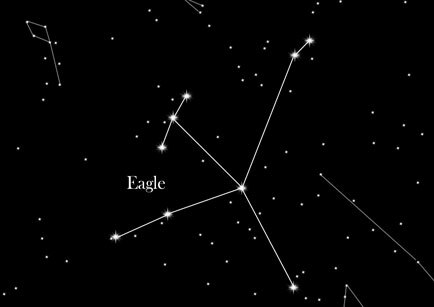 The Eagle is a striking constellation found in the summer and autumn sky of the Northern hemisphere. It is on the plane of our galaxy, the Milky Way. Its main star Altair has 10 times the luminosity of our sun, and its brightness makes it particularly prominent in the night sky. The main star of the Eagle, Altair (α Aquilae), is a very bright and prominent star. It forms part of the extended summer triangle. In the immediate vicinity are the bright stars Tarazed (γ Aquilae) and Alschain (β Aquilae). Together, the three stars form the head of the eagle. The remaining stars represent the outspread wings of the bird. Brightest star: Altair has a relative magnitude of 0.8m. Together with the stars Deneb (Alpha Cygni) in the constellation Cygnus and Vega (Alpha Lyrae) the so-called Summer Triangle is created. Among the twelve labors of Hercules was the procurement of the golden apples of the Hesperides. Along the way, the hero discovered the unfortunate Prometheus who was chained to a rock. The father of the gods Zeus imposed the punishment, because against his will Prometheus had helped human kind by bringing them fire and enlightenment. The eagle came every day, pulled out a piece of Prometheus' liver and ate it. Hercules killed the eagle with an arrow and released Prometheus from his agony.